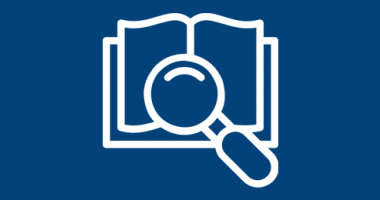 Reports provide a window into your data and can be very simple or extremely complex. 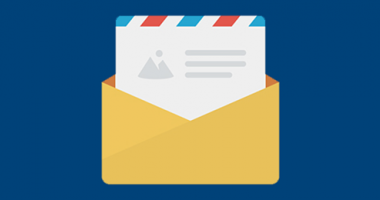 They can range from a basic contact list like an address book to a large sales pipeline report grouped by salesperson or territory. 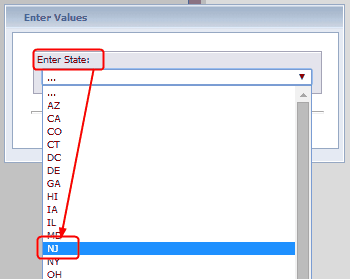 The data that populates a given report can "fixed" and provide data a certain way each time it runs (for example, "last month's new contacts") or a report can accept parameter values allowing a user to define criteria for a report at run-time (as an example here, selecting a date range and a specific salesperson). Please note that for Crystal Reports to be used by wMobile, the Crystal Reports Runtime engine must be installed for the functionality to work. 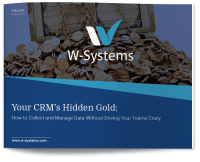 This is typical for running reports successfully in GoldMine; if can run a report in GoldMine, you can run that report using wMobile. The reports themselves must be written using Crystal Reports tools and then stored/maintained in GoldMine. 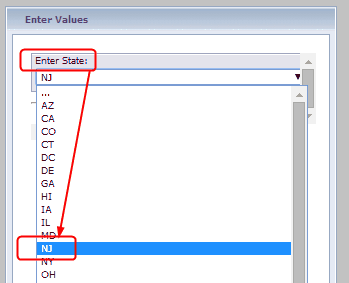 For this blog article, we'll assume you already have one or more Crystal Reports built and ready to use. 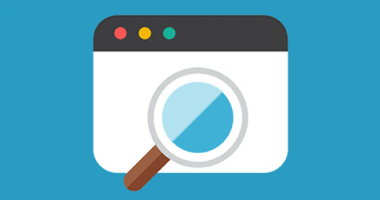 In the following sections, we will walk you through the steps required to run a Crystal Report in the wMobile Desktop edition and then in the wMobile Phone edition. Once the reports are accessible for use in GoldMine, they can then be accessed using the Reports button on the toolbar. 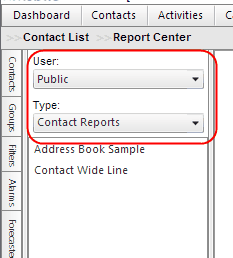 To access a specific report, select the appropriate user library and category the report was filed to. Only Crystal Reports will appear on this list. 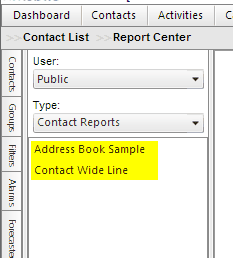 To run a report, double-click the report name (for the following example, "Address Book Sample" was used). 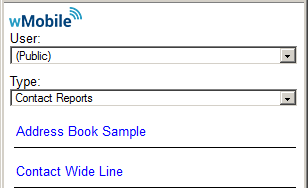 Once the reports are accessible for use in GoldMine, they can then be accessed using Reports from the wMobile Home Menu. 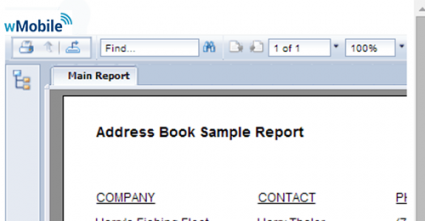 To run a report, click the report name link (for the following example, "Address Book Sample" was used). 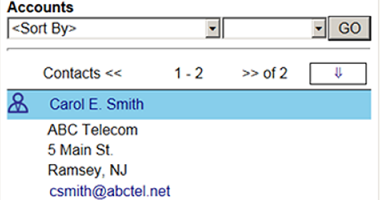 If you use Crystal Reports, wMobile is ready to support displaying them.